The lives of courtiers in the Edwardian royal household was smarter and more opulent than during the reign of Queen Victoria, but pomp and ceremony remained (and was even heightened, since Kind Edward VII was more conscious of his regal appearance and accouterments than his mother). Though the position wasn’t extremely coveted, since a maid of honour was required to be “on call” even outside of her waiting period, but for a young lady of gentle birth and impecunious purse, court life widened the scope of life she could ever hope to experience. A Maid of Honour must be the granddaughter of a peer, if not nearer in blood; for, unless some special provision is made, the office cannot be held by anyone below that rank. Secondly, she must be a good linguist, not only because of the foreigners she will meet at Court, but because she will be prevailed upon to deal with some of Her Majesty’s private foreign correspondence. Her conversational powers must be considerably above average, she must possess a talent for music and singing, and an ability to read aloud with clearness and expression. On all State and semi-State occasions, they take their place in the Queen’s suite, and accompany Her Majesty to any charity function she may attend. When the Queen pays a private visit, too, a Maid of Honour is usually in attendance, also when she goes to the Opera to theatre. When the Queen holds a Drawing Room for the presentation of debutantes, her Maids walk in the Royal procession to the Throne Room, and stand immediately around Her Majesty during the ceremony. This also applies to State concerts and State balls, when they sit immediately behind the Queen and Royal Princesses. Queen Alexandra abolished the £1000 dowry, chiefly on account of one year several Maids of Honour married within a few months of one another, after a period of service so short as to be quite inconsonant with such a large dowry. Queen Alexandra there arranged that £100 a year should be added to the allowance of each Maid of Honour, so that each now receives £400 annually and no dowry. It cannot be said to be a munificent allowance in view of the expense entailed for Court dresses, etc. In Queen Victoria’s time, her Maids of Honour spent a quarter of their pay on gloves as they were never permitted to enter “the presence” with bare hands. 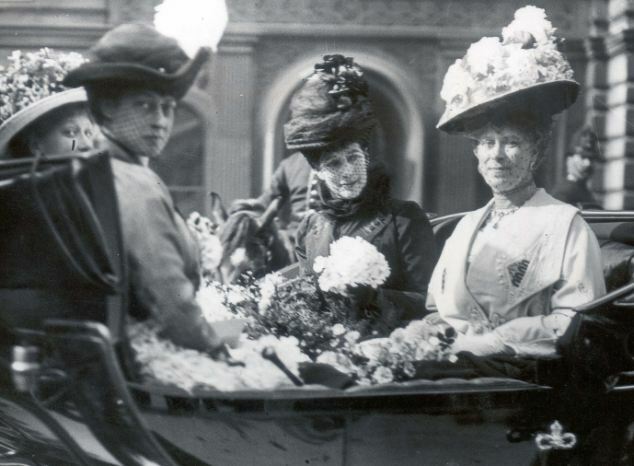 Queen Alexandra objected to striking apparel, such as big hats and vivid colours, and preferred her Maids of Honour wore soft shades of color such as gray, white, and mauve. Is that not Queen Mary on the extreme right and Queen Alexandra back right? The caption is correct, but a little confusing. Changing it! Such a close family resemblance between Queen Mary and her Royal majesty , Queen Elizabeth II. The hats are very nice aren’t they? b] she would be prevailed upon to deal with some of Her Majesty’s private foreign correspondence. How amazing! These two tasks seems like the delicate responsibilities of professional diplomats, not slightly mature debutantes wanting to keep their mothers happy. It’s actually funny that these aristocratic and upper class girls were barely educated (in comparison to the middle class girls who attended college and university), but were expected to possess a myriad of skills taught in higher education. On the other hand, this is also why many of them were anti-suffrage. Sounds like more trouble than it’s worth! That’s why I said it wasn’t that coveted! The maids of honour couldn’t even wear what they liked!